Welcome to Riverside, where the aristocratic and the ambitious battle for power in the city's ballroom, brothels and boudoirs. Into this alluring world walks Katherine, a well-bred country girl versed in the rules of conventional society. Her mistake is thinking that they apply. For Katherine's host and uncle, Alec Campion, aka the Mad Duke Tremontaine, is in charge here—and to him, rules are made to be broken. When Alec decides it would be more amusing for his niece to learn swordplay than to follow the usual path to marriage, her world changes forever. Blade in hand, it's up to Katherine to navigate a maze of secrets and scoundrels and to gain the self-discovery that comes to those who master: the privilege of the sword. What a great sequel! Alec has come into his inheritance a decade or so after Swordspoint. Alec is no less manic, but the protagonist to this tale is his niece Katherine whom he is trying to make a swordsman on a whim, but with all Alec's plans we do later discover their is a deeper meaning to it. Katherine matures and grows throughout this novel from a character I didn't partially like to a woman who understood the world around her and be independent and free to choose a parter to marry or choose to stay unmarried. Katherine has a very different outlook to life than any of the other characters in Swodspoint, and her tone is young, innocent and endearing. Yet the tone to The Privilege Of The Sword is sadder than Swordspoint as Alec and Richard's glory days are over. Richard is blind and living far away and Alec misses him terribly and consequently sleeps with everything and gains the reputation of The Mad Duke. But the ending makes everything worth while and I'm so happy that we get to see these two men happy together. The only criticism I have is that I wanted to see more Alec and Richard, these two characters make these novels for me. 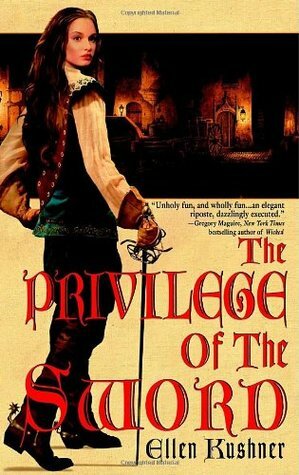 What I appreciate about these novels is that Kushner explores the role of women in The Privilege of the Sword and how powerless they are in a very patriarchal society, and this aspect of the book made me respect Katherine a lot more.